Sunset is magical from Sea and Sky Villa in Santorini. A Villa with a View. A perfect seat to watch the sea. Even the food and wine come with a view in Santorini. In Sea and Sky Villa, time seems to stand still. Let your gaze wander freely all over the island`s natural beauties and into the magic of the Aegean Sea. Relax and unwind in a warm, cozy environment where traditional decorating is combined with luxury and …let yourselves enjoy the dream !The Sea and Sky Villa has been furnished with a functional and tasteful design so as to respond to your needs as well as to your aesthetics. Sea and Sky Villa is built following the typical Aegean architectural style. It harmoniously combines neo-classical forms with arches and rounded edges at the walls, together with modern elements all together resulting in a dreamlike setting. Whole Villa There are four traditional rooms in the villa. Each of them has two double and two king size built-in beds and two bathrooms. A cruise with a sunset background and / or round the island or the volcano with a drink and a meal. Horse riding through paths and traditional villages even in the wave with commemorative photos. This view will not disappoint. It is utterly breathtaking. 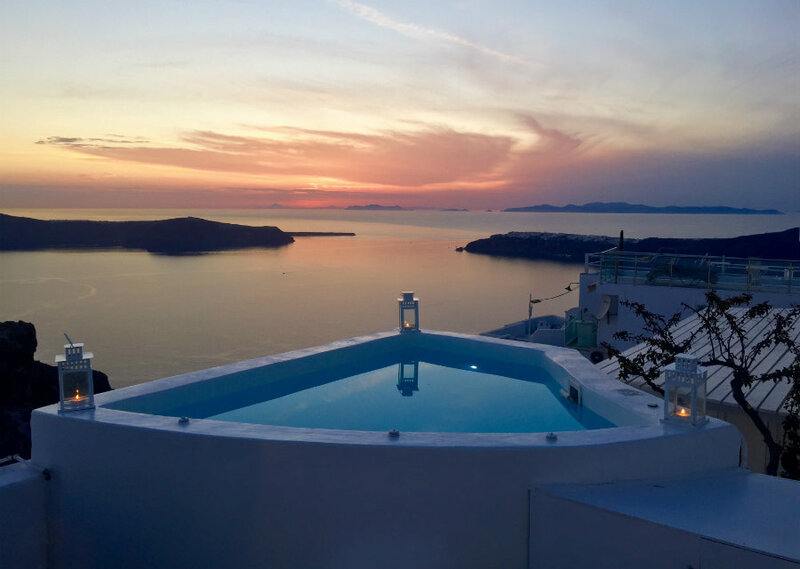 Sunset is magical from Sea and Sky Villa in Santorini. Have you ever had breakfast at your room where you eat it on your balcony overlooking the incredible views of the Aegean Sea? A perfect seat to watch the sea. Even the food and wine come with a view in Santorini. Unique way to spend a vacation. Sea and Sky Villa simply encapsulates the perfect experience on a Cycladic island. Take your time in Sea and Sky Villa to experience tradition and luxury. Come to be surrounded by a lush screen of great blue and dive inside to discover its secrets !